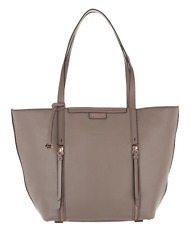 Up for sale is Radley London Large Work Tote Bag in Natural Color. Spacious Multifunction Tote & Laptop Compatible - Rare Item! Inspired by art & created with digital data in mind, our new Data Dog print incorporates our iconic Scottie dog. From RADLEY London. Modern zipper pockets on the front of this tote add storage options. Open top, hook entry, double handles, two front zip pockets, back slip pocket. Shell 100% leather;. Lined interior, two front-wall slip pockets, one back-wall zip pocket. GENUINE RADLEY EXTRA LARGE LEATHER TOTE WORK HANDBAG BNWT - RRP £239.00. Condition is New with tags. Dispatched with Royal Mail 1st Class. 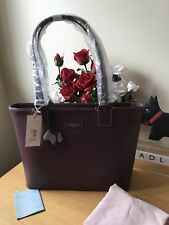 BEAUTIFUL RADLEY “FARNINHAM’ LARGE LEATHER SHOULDER TOTE SHOULDER HANDBAG. Radley authentication inside and printed in gold foil on the front label. Genuine Radley gift box can be provided. This bag will make a lovely present RRP £239.00. VERY LARGE RADLEY TERRACOTTA BARREL BAG. BEAUTIFUL BAG WITH FLORAL LINING. SIZE 36CMS WIDE X 20CMS HIGH X 15CMS DEEP. RADLEY X LARGE SIGNATURE WEEKEND/ TRAVEL HOLDALL VERY RARE WITH EXQUISITE DETAIL. TNE FRONT HAS RADLEY I SIDE THE HOT AIR BALLOON BASKET ALL IN LEATHER APPLIQUE In Red brown white and black leather. The back has radley embossed into the soft leather plus a large zipped pocket with a stunning blue needlecord lining. Radley Largest Leather Bag. Black And Blush With Duster Bag. Rare! Stunning Radley double handles full leather bag. I used as a work case and always had comments as a very limited design of this size and quality. Sad to see it go! Very expensive bag new cost over £200. Good used condition and would make great work bag for lap top and files as zip and deep enough. Duster bag included which is immaculate. Grab a bargain as having a clear out due to re design. UK only. Pay pal only Will post but ONLY according to signed for recorded and NO refunds. NO refunds. Radley Extra Large Black Leather & Suede Grab Bag - 'Bliss Crescent' - NEW - RRP £249. External Features: The bag features stunning rose gold hardware. Internal Features: The bag has a zipped pocket and two slip pockets. Radley Extra Large Green Leather & Suede Grab Bag - 'Bliss Crescent' - NEW - RRP £249. External Features: The bag features stunning rose gold hardware. Internal Features: The bag has a zipped pocket and two slip pockets.